This is the name given to a number of tumours that can affect the brain, where a group of cells grow out of control too quickly and too irregularly. This is the basis for all cancers, and there are different types affecting the brain. These are named depending on the area and cells affected, and there may be more than one name for one type of tumour, which can be confusing. 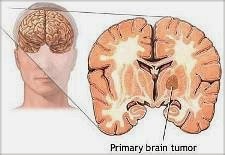 Tumours that originate solely in the brain are called primary tumours whereas other body tumours that have spread to the brain are called secondary tumours. The cause of brain tumours remains unclear and although many possible causes have been suggested, there is little good scientific evidence for any of them. Most brain tumours cause headaches, nausea and vomiting in their early stages due to the increasing pressure developing within the head as the tumour grows. The type of headache is often characteristic in that it is usually worse in the morning (sometimes bad enough to wake you up) and on coughing, sneezing or bending forward - i.e. any activity that increases the pressure in the head temporarily. Another sign may be an epileptic fit, or seizure that can occur out of the blue and which may be very frightening. Blurred or double vision is relatively common also, as is early morning sickness often linked to the headache. It is often the case that any other symptoms experienced are linked to where in the brain the tumour is located. Thus, tumours at the front of the brain can cause mood swings, personality disorders and weakness of one side of the body whereas ones at the side of the brain can cause strange smells, blackouts or feelings of deja vu. • An examination of the back of the eye using a special type of torch (an ophthalmoscope) - this can see whether the optic disc at the back of the eye is swollen, a sign of raised pressure within the brain (raised intracranial pressure). • Examination of the tongue, facial muscles and reflexes. • Testing for power and sensation in the arms and legs. Other investigations are then usually performed to confirm the presence or otherwise of any brain tumours including special brain scans. A CAT (computerised axial tomography) scan is a special X-ray that takes a series of pictures of the head and so builds up a cross-sectional image of the brain. A dye is injected into your arm to help the detail of the pictures here. A similar scan, but one that uses magnetism instead of X-rays is an MRI (magnetic resonance imaging) scan, and involves slowly passing through a long cylindrical tube whilst lying completely still as the scan is taken. Dye is used as in the CT scan, and both types of scan are painless. A newer type of scan, and one which is not always readily available, is a PET (positron emission tomography) scan where radioactive sugar solution is injected, and can show whether a tumour is benign or malignant, or whether it is active at present. The dose of radiation is no greater than that used in an ordinary X-ray, and there are no harmful side effects from it. A chest X-ray is taken as standard, as is a skull X-ray which can occasionally show up tumours on them. An EEG (electrencephalogram) records the electrical activity within the brain, with wires being painlessly attached to the head using a special gel that washes out easily afterwards. This gives a tracing of the brain nerve impulses in the same way that an ECG test records the activity of the heart. To find out exactly what type of tumour is being dealt with, a biopsy is the only definitive test. Under anaesthetic, a small piece of the tumour is removed and examined under a microscope, allowing exact diagnosis of the tumour to occur. This depends on whether the tumour is a primary or secondary tumour, and the type of primary tumour involved if it is this type. With primary tumours, the best treatment is to remove them surgically, often followed by radiotherapy (X-ray) treatment to ensure any tumour cells that may have been left behind are killed. If such surgery is not possible, chemotherapy (anti-cancer drugs) are used as the main treatment in courses usually lasting several weeks. Other treatment may also be needed at the same time, such as medication to prevent any fits or to reduce the pressure inside the brain due to swelling. Secondary tumour treatment depends on where these have arisen from (e.g. breast or bowel cancer). The usual treatment is radiotherapy to shrink down these secondary cancers as well as treating the primary tumour according to its type and location. With secondary tumours, the whole aim of treatment is to reduce any symptoms and improve the quality of life in general. This is individual for each person, and your specialist will be able to give you very good advice as to what symptoms you may expect, and how readily your tumour should respond to treatment. It should be remembered that many people have brain tumours and are treated in many different ways, so the fact you are having a different treatment to another patient does not necessarily mean yours is a more serious type. A positive mental attitude is important at this time, and there are many self-help groups that are able to give practical and pragmatic advice to help you through your treatment. If you are unsure about any aspect of your treatment - ask. Your doctor or specialist should be only too happy to try to answer your questions and reduce any unnecessary anxiety. 1. Have you been woken up at night by a headache? 2. Have you been sick? 3. Do you have any problems with your eyesight? 4. Have you been falling over or more clumsy recently? 5. Do you feel generally unwell? 1. How risky is brain surgery? 2. Will I lose my hair with treatment, and what are any other side effects? 3. Do I have to stop driving? 4. Will I need to stay on anti-epileptic drugs for life? 5. How soon can I return to work after treatment? By Dr Roger Henderson, MB BS Lond., LMSSA Lond. Published Free Medical & Health Information Site.